It’s TIME for BETTER CAREER at CITIZENS. Citizens Bank International Limited has been established as a reliable and trustworthy partner for all financial solutions. Institutionalized by a highly professional and experienced team, we have gained credibility in banking sector through quality financial service. 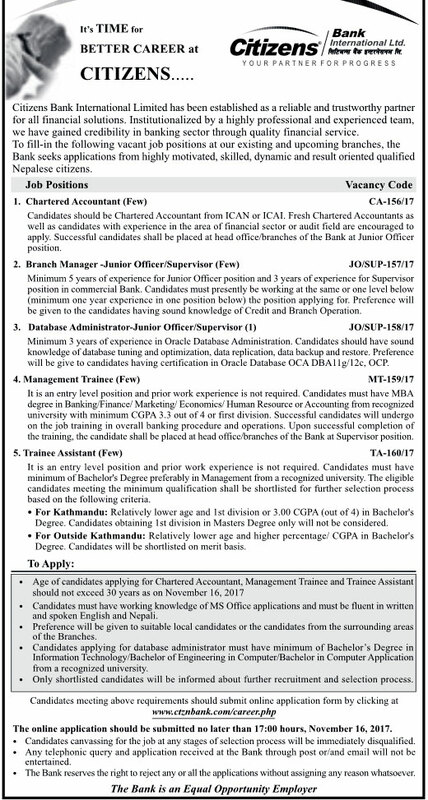 To fill-in the following vacant job positions at our existing and upcoming branches, the Bank seeks applications from highly motivated, skilled, dynamic and result oriented qualified Nepalese citizens. Candidates should be Chartered Accountant from ICAN or ICAI. Fresh Chartered Accountants as well as candidates with experience in the area of financial sector or audit field are encouraged to apply. Successful candidates shall be placed at head office/branches of the Bank at Junior Officer position. Minimum 5 years of experience for Junior Officer position and 3 years of experience for Supervisor position in commercial Bank. Candidates must presently be working at the same or one level below (minimum one year experience in one position below) the position applying for. Preference will be given to the candidates having sound knowledge of Credit and Branch Operation. Minimum 3 years of experience in Oracle Database Administration. Candidates should have sound knowledge of database tuning and optimization, data replication, data backup and restore. Preference will be give to candidates having certification in Oracle Database OCA DBA11g/12c, OCP. It is an entry level position and prior work experience is not required. Candidates must have MBA degree in Banking/Finance/ Marketing/ Economics/ Human Resource or Accounting from recognized university with minimum CGPA 3.3 out of 4 or first division. Successful candidates will undergo on the job training in overall banking procedure and operations. Upon successful completion of the training, the candidate shall be placed at head office/branches of the Bank at Supervisor position. – For Kathmandu: Relatively lower age and 1st division or 3.00 CGPA (out of 4) in Bachelor’s Degree. Candidates obtaining 1st division in Masters Degree only will not be considered. – For Outside Kathmandu: Relatively lower age and higher percentage/ CGPA in Bachelor’s Degree. Candidates will be shortlisted on merit basis. > Candidates must have working knowledge of MS Office applications and must be fluent in written and spoken English and Nepali. > Candidates applying for database administrator must have minimum of Bachelor’s Degree in Information Technology/Bachelor of Engineering in Computer/Bachelor in Computer Application from a recognized university. > Only shortlisted candidates will be informed about further recruitment and selection process. The online application should be submitted no later than 17:00 hours, November 16, 2017. > Any telephonic query and application received at the Bank through post or/and email will not be entertained.